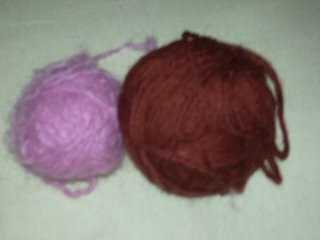 As you can sort of tell from this picture (sorry about the fuzziness), these are the two colors I was thinking of combining together for a sweater. 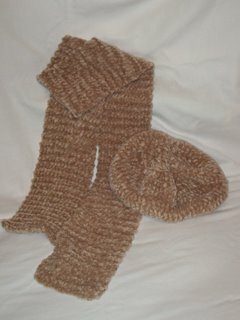 The mauve on the left is mohair, and the brown on the right is Knit Picks Wool of the Andes in Maple Syrup. They look like a better color combination in reality...when they're not all out of focus. I just haven't decided if I should do the bottom out of the brown and the top out of the mohair, or combine them. I guess another swatch is needed. 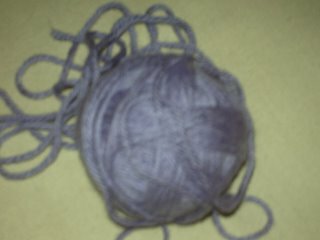 This was my first knitting attempt EVER...I would not recommend chenille to beginners. 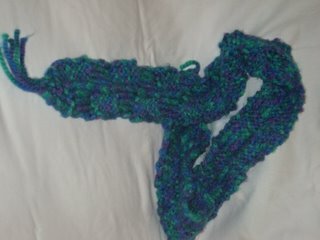 This scarf was my second knitting adventure. I finished the first one in Utah, and had to go get more yarn! 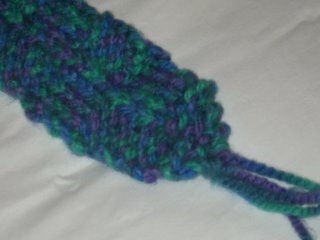 I grabbed a skein of Jiffy Thick & Quick from a local JoAnn's, and decided to do the scarf pattern that was on the package. 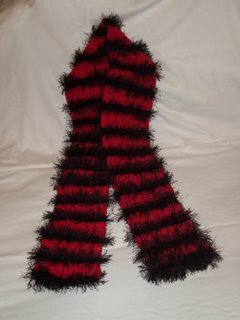 This scarf was for my brother. He saw the pattern on Knitty, and wanted one to go with his leather jacket. He thought it would be fun to dress like Mick Jagger sometimes. Of course, my brother is a LOT better looking than Mick Jagger (IMHO). 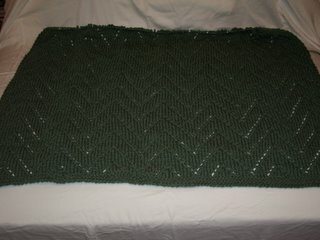 This last picture is one of the afghan I knitted for my grandmother (how backwards is that?! ), and she LOVES it. She wraps up in it every night and watches TV. You gotta love making something that they use. And once again, my photo taking skills are at their best in this shot. Here's the Debbie Bliss that I wanted to make a sweater out of, and then realized the style I liked wouldn't look that great on me. So, now it's gone back into the stash. I'm trying to decide if I should leave it there for a while, or put it to good use. Any ideas? So much knitting...so little time...back to the needles! The afghan is beautiful. I love the herringbone look to it and the colour!